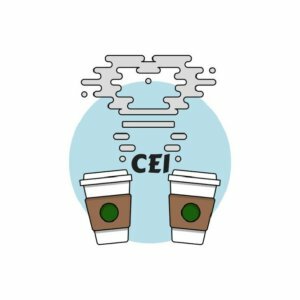 Affectionately known as CEIs, these Pitt students meet with students to learn about their diverse array of Jewish interests, passions, and stories. They’re always happy to treat a peer to free coffee, tea or frozen yogurt, while chatting on campus. 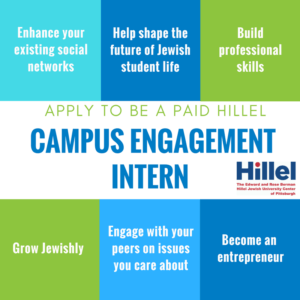 Applications for the August 2018-May 2019 Campus Engagement Internship are now open! Please review the position description and contact Jodi Tandet at [email protected] with any questions. Please list which campus student groups or activities you are currently involved in, with a brief description of how you're involved (including any leadership positions). Note: This can include events run by Hillel-affiliated student groups, such as Panthers for Israel, Challah for Hunger or Jews of Social Work. Previous Engagement Institutes have been held at The Washington University in St. Louis, though Hillel International may change the location this year. All expenses, including travel, food and a university dorm room accommodation, will be covered. Being unable to attend Engagement Institute will NOT disqualify candidates from becoming interns, though attendance is highly rewarding and beneficial. Somewhat, but I would like some training! Not really, but I'm willing to learn and try! Please hit "submit" to send in your application. All applicants will be contacted by the end of March. Finalists will be brought in for a 30-minute interview. Please remember to review the position description!